July 11 is 7-Eleven’s Birthday and this year for their 90th birthday, the American classic is celebrating by giving any guest, customer or not, a free small Slurpee. Guests can choose between different flavors such as Coca-Cola, blueberry, watermelon/lime, cherry, and lemonade. The 7-Eleven located on NW 2nd Avenue in Boca was full of excited guests who could not wait to get their hands on a Slurpee since the day proved to be a hot one with a high of 92 degrees and clear sunny skies. 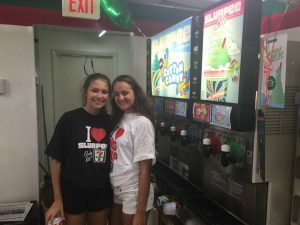 The 2nd Avenue store, apart from their usual two employees, hired two volunteers, Taylor Knoll and Andra Durgee to help serve Slurpees to guests since the demand for them is so high every year. Both Taylor and Andra are students at Boca High and got the chance to volunteer. This is Taylor’s third year volunteering for 7-Eleven and serving up delicious and refreshing Slurpees to guests while for Andra, it’s her first time doing it. Andra said she got the opportunity to volunteer because she is friends with Taylor. “It’s fun, sometimes there’s people, sometimes there’s not, either way, it’s not boring because we’re doing it together,” she said. Walking into the 7-Eleven, one can see the long line of parents and children as well as the occasional college student, businessman, worker, and even FAU’s women’s basketball team. Truly 7-Eleven’s birthday is a community wide event for those who know of it in Boca Raton, and for those who do not, like Boca Raton resident Giovanni Martin, it is a pleasant surprise. “I didn’t know there were free Slurpees until I came in,” he said. Giovanni got his favorite, a Coca-Cola Slurpee, a Mr. Goodbar, and bought a set of Florida Lottery tickets. FAU student and local resident Zachary Scop was very excited about getting his Slurpee saying, “Dude, Slurpees are my life!” considering he was anticipating the day for over a week. The free Slurpee promotion, which goes from 11 a.m. to 7 p.m. is the beginning of a Slurpee promotion week for 7-Eleven. Starting July 12 until July 18, if you buy seven Slurpees with the 7-Eleven app, you will get 11 free Slurpee coupons. 7-Eleven is also selling metal-like Slurpee cups for $2.99 at all of their stores. With the purchase of the reusable cups, the customer gets their first fill up for free.